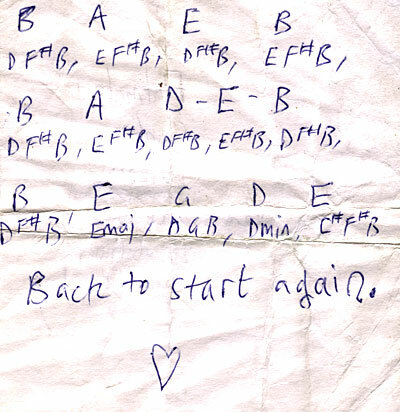 A friend of mine found this chord progression in a practice space; not very uncommon, but I like the way it tells you to repeat it forever. We tried playing the main one (B A E B) and it sounds a little bit like Blitzen Trapper. We assume one is meant to be for bass or second guitar, but we can’t be sure which, because the two played together don’t sound so good, either way.